This week on Screen Heroes, Ryan and I are joined by our prop builder friend, Jon to talk about how the DC Comics iconic character, Batman has changed over the years in movies, TV, and video games. We hit on the classic Adam West version, Tim Burton’s take, as well as George Clooney. We also discuss the big Christopher Nolan trilogy and the highly anticipated Ben Affleck debut in Batman v Superman: Dawn of Justice. Outside of movies, we talk about the very popular Arkham video game franchise plus some of Batman’s better known animated works like The Dark Knight Returns and Batman: The Animated Series. Before we jump into the Dark Knight, the three of us provide our initial thoughts on FOX’s new R-rate superhero film, Deadpool, starring Ryan Reynolds. We’ve all seen it, now we talk about it. We discuss what we liked about it plus some things they might have done better. It’s a short part of the episode but beware. This article is going to look very familiar, because if you are a frequent reader,Ii reviewed the 6″ version of this figure not long ago. You can find that article here. 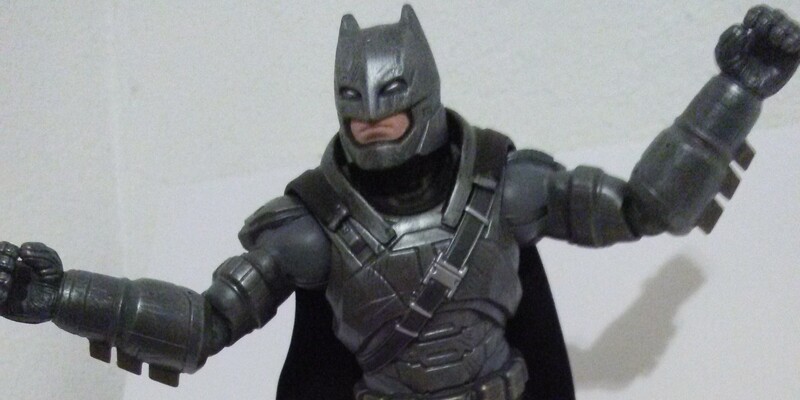 This review is for the 12″ Mattel Armored Batman action figure in the Multiverse line. I haven’t spotted this figure in a store and instead, purchased this one on Amazon.com here. To begin, the packaging is very similar to the 6″, except in a larger scale, that will be a common theme for this review. Judging by the likenesses shown on the back of the package, this figure has the best likeness of all of the 12″ figures. Both Superman and Wonder Woman look nothing like their movie counterparts based on these photos. Even this Batman has very large lips, to the point of almost looking cartoony. The interior packaging is nearly identical to the 6″. When you get the figure out of the packaging, it is a bit disappointing for the scale and price. The figure appears to have been sculpted at a 6″ scale and blown up to a 12″. This results in the details that look good on the 6″ looking blown out of proportion or overly large on the 12″. The one bonus on this figure has over the 6″ is an actual fabric cape, though it lays flat and lacks the cool creases the 6″ version has sculpted in. The paint is very similar to the 6″, and because of the increased scale, the lack of detailing around all the battle damage is even more obvious here. He comes with no accessories, and that is disappointing. What is Batman without his cool toys? A simple batarang would have given him something cool to pose with. This figure has 10 points of articulation, versus 20 on the 6″. The most noticeable change is the lack of articulated ankles, which makes this figure very difficult to pose in any position other than a boring straight up and down standing position. The hips and shoulders have a decent range of movement. Batman is more flexible than I ever imagined. Overall, i think that you get a better figure if you buy the 6″ version. I’d give this figure 4/10 cans of shark repellent, or 2/5 spaceships. Did you pick up either of these Multiverse figures? Did you find a different armored Batman figure you liked more? Comment below! Most people on January 1st were sleeping off a hangover or enjoying the day off work. The die hard DC Comics fans were most likely planning a trip to their local toy retailer, as that day marked the official sale date for the Batman V Superman: Dawn of Justice merchandise. 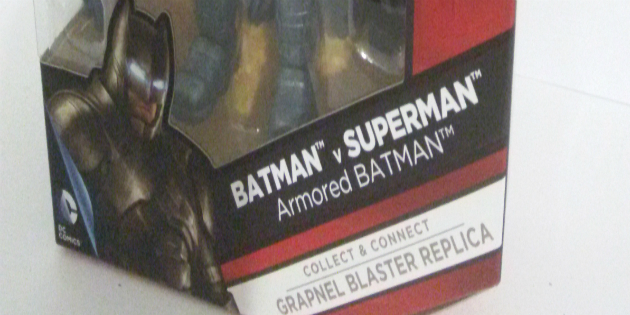 As a major Batman fan, finally having some collectible versions of him in his Superman fighting armored suit is amazing. My first find is the Mattel 6″ Multiverse version. The packaging is eye catching, featuring character artwork on the side and front.. If you are a collector that likes to keep your figures in the box, you won’t be disappointed. It displays very well. Each Dawn of Justice Multiverse character has a piece of a grapnel gun replica, so if you want the whole gun, you have to get each of the characters. Only 4 pieces are available now, the other will be released in the future. As you can see, the four figures available at the moment are Armored Batman, Batman, Superman and Wonder Woman. However, I was at the retailer while these were unboxed, and among about 30 of the Multiverse figures, there was not even one Wonder Woman. It seems likely that she will be the most difficult to find of the bunch. The convenient part about that is that she comes with a part of the stand for the grapnel gun, so you can still build the actual gun without her. The box is easy to open. Cutting through a couple pieces of tape allows the figure tray to slide right out. He comes with a gun accessory, as well as his piece of the large grapnel gun replica. The sculpt is good, though the paint doesn’t really show it. It’s a very basic paint job, and a little disappointing. A little more highlighting of the battle damage would have gone a long way. This figure is a large hunk of plastic, and despite having large feet and articulated ankles, its fairly difficult to get him to stand in anything other than basic poses. You can do it, it just takes a lot of patience. I wish he had been proportionally bigger than the other characters in this line. Its a little odd to have him stand at the same height as characters that he should be looking down upon. Overall, I would give this character a rating of 6/10 fistfuls of Batarangs, or 3/5 Spaceships. However you want to count it. A couple of them had spots on their faces as well. So check and double check, you don’t want to discover a shoddy paint job when you get the figure home! If you’re looking for the figure, it is currently available on Amazon for $19.99 and Prime shipping here. Have you picked up any of the new Batman v Superman action figures? Comment with your thoughts. There’s been a decent amount of DC Cinematic Universe news today. First, Untitled Batman film is slated for 2018 and will allegedly be directed by the Dark Knight himself, Ben Affleck. This will be a big job for the director since he will also be wearing the cowl as Batman. This film is still very early on in development, so we don’t know exactly when it takes place, before Batman v. Superman or after Justice League. We’ll have to wait. Then, there’s Green Lantern, my personal favorite superhero. Rumor has it that the solo filmed scheduled for 2020 will star multiple Lanterns, most likely Hal Jordan, Guy Gardner, and Jonathan Stewart. This would be a lot of fun for GL fans since these three get together from time to time when a big enough bad guy is afoot. Additionally, Chris Pine might be up for the role of Hal Jordan since this would be long after Star Trek Beyond. What do you think about Batfleck directing his own Batman film? What about the possibility of multiple Green Lanterns in one film? Let me know your thoughts in the comments!